Sinceramente este Michael esta igualito deberia tener mas Likes . I must admit,That's great work shine1608, People say "It not Michael, It's some other kind of dude" or "This is not the actual Jackson". According to my opinion This is the best a man can create a mangatar of Michael,It looks very real. are u joking???? it's so NOT him!!!! 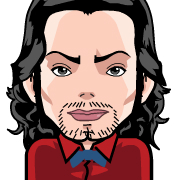 It isn'n Michael Jackson!! It is PHILIPP KIRKOROV from Russia! Google him, look and you will not see the difference!